Postconflict in Colombia (17). Can Colombia’s FARC turn to politics? 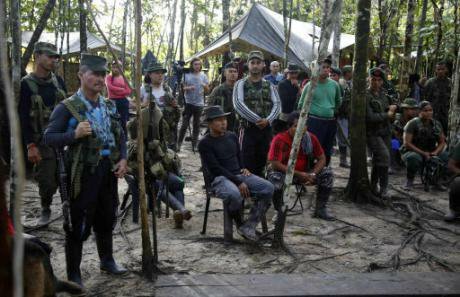 Rebels of FARC, listen to a lecture on the peace process in the southern jungles of Putumayo, Colombia. 17 August 2016. AP Photo/Fernando Vergara. All rights reserved. Whatever happens in the October 2nd plebiscite in which Colombians will vote to approve or reject a peace deal with the FARC (Fuerzas Armadas Revolucionarias de Colombia), the longest insurgency in the Western Hemisphere is undergoing a major transition. It is not the first time the FARC end up at the negotiation table with the Colombian government. There have been three significant attempts. But the peace talks that concluded in Havana on 24 August 2016 are different to previous, failed attempts. Not only is it the first time both parties have sat down to negotiate a specific agenda and come to a final agreement, both sides have shown signs of deeper transformation. For the FARC, their acknowledgement of the Colombian state, the agreement to put away their weapons, break any links with drug trafficking and join the democratic process is unprecedented. After an armed conflict that has lasted over half a century, there are an estimated 7,000 FARC fighters and about 8,000 FARC militia members that will be leaving their weapons behind and reintegrating into Colombia’s social, political and economic life. Many have been isolated from Colombian society and living a life of war and survival in the Colombian jungle. So, now that a deal has been struck, how will the FARC be able to make the transition from a guerrilla movement in arms to a political and social movement? It is not clear which way the October plebiscite will go. A ‘No’ vote’ would deal a severe blow to the process and make the final agreement non-implementable. But the FARC have said that they would transition regardless, so it is important to understand what the final agreement says and what are some of the biggest challenges lying ahead for the FARC’s political transition. The essence of this peace agreement is that the FARC will cease to exist as such and will become a “political movement without arms”. This is an unprecedented and fundamental shift. The FARC’s trademark over the last fifty years has been the combination of ‘all forms of war’ (todas las formas de lucha). The group has always had military and political strategies running in parallel, often prioritizing one over the other. After the collapse of the previous peace negotiations in the Caguán (1999-2002), it focussed on armed warfare. But the FARC’s essential argument for taking up weapons has been the deep political exclusion entrenched by the National Front pact of the late 1950s. The agreement takes a number of measures to ensure broader political participation and the inclusion of the FARC in the political system. Specifically, the FARC would have a number of spokespersons in Congress with a voice but no vote to discuss issues related to the implementation of the peace agreement until 2018 . From 2018 onwards, the political party coming out of the FARC’s transition will participate in elections and will have five reserved seats in both Congress and the Senate for two electoral periods. This is a good time-bound and limited transition mechanism that gives space to the FARC to prove they are able to do politics and get elected on their own merits. The political party will also receive limited funding for a period of ten years. Alongside the specific support to the FARC, the peace agreement also proposes a special ‘Opposition Statute’ that aims to ensure political parties and social movements in opposition are able to participate in democratic spaces. After more than fifty years of war, the FARC need to learn how to do politics without weapons and gain experience in the public arena. The guerrillas increased isolation, particularly during the last fifteen years with the escalation of the confrontation and their branding as a terrorist organisation, has meant that they have been interacting with people with a similar world-view. Their self-perception is that they represent the interests of peasant-farmers and that they play an important political role, but the truth is that they are out of touch with modern urban Colombian reality. Though the FARC have been learning fast and have shown skill and seriousness during the Havana negotiations, the negotiation itself has only involved a small proportion of the group. The issue is how the FARC ‘sells’ this transition to the rest of the organisation and how the fighters make the switch into social and political leadership. In terms of bringing the rest of the armed group along with them in this transition, the FARC have been somewhat constrained during the negotiations based in Cuba. Their attempts to divulge information about the negotiation and travel in Colombia to meet with their fighters and constituents have been understandably restricted by the government who feared a backlash from public opinion seeing the FARC do ‘politics’ while they still had their weapons. But this should no longer be the case; the FARC leadership need to be able to access their people and zones of influence if they want to be able to bring them along with them in this process. The FARC will hold its 10th conference in September to get buy-in from the rank and file, approve the accord and dissolve itself as an armed group. The fact that the FARC is a deeply hierarchical organisation will help bring the whole group along. But how much cohesion they can maintain during the transition is a different story. There have already been small signs of fracture. The First Front of the FARC for example announced back in July that it would not demobilise in defiance of the leadership. A key issue here appears to be the differentiated involvement of certain fronts in illicit economic activities such as drugs or mining. In the agreement, the FARC have committed to “breaking the link” with drug trafficking and pilot crop substitution programmes have already started in areas under FARC control. While at the leadership level they have seen their involvement in the drugs trade as a pragmatic way of funding their war, the leaders know that this has harmed them politically. The risk of dissent is higher at the mid to lower ranking levels were there might be splits or certain groups or individuals who refuse to fall in line with the decisions made by the leadership. In the agreement the government committed to fund demobilized fighters for up to twenty-four months with a stipend of 620.000 pesos, equivalent to 90 per cent of the Colombian minimum wage. This should help reintegrate fighters in a social and productive life that is not related to illicit activities. But the biggest risk actually comes from the vacuum that will be left by the FARC, with a number of other armed groups and criminal gangs vying for drug control. This is worrying in a context where coca production is on an upward trend, increasing by 39 per cent last year. Though the FARC have always made it a requirement for their heads of squadrons to be both militarily and politically equipped, over the years the ‘political’ element has been much less present. The younger FARC leaders have fewer links with local communities and struggled more to gain their respect. The leadership knows this and this is one of the reasons that a negotiated solution to the conflict became more appealing in the context of trying somehow to salvage their social and political capital. Though the leadership has attempted to prepare the troops through political and social training in its camps, particularly since the ceasefire began in July 2015, they will need to continue doing so in the normalization zones to help ease the transition. The FARC needs to use this transition time to redefine its political platform and persuade its troops, but also make a convincing pitch to the population in areas where they have a historical presence that the use or threat of force is well and truly no longer part of their arsenal. Hanging over all of this is the central question of whether the FARC’s transition into becoming a political actor will be tolerated. The strength of the ‘No’ faction in the upcoming plebiscite shows that there is an important sector of the political establishment that is much more afraid of confronting the FARC politically rather than on the battlefield. Former President Alvaro Uribe and like-minded politicians will only be content with the FARC’s capitulation. The last time the FARC tried entering politics following a cease-fire in the early 1980s, their political party, the Unión Patriótica, fell victim to a ferocious extermination campaign by right-wing paramilitaries and 2,500-3,000 of their members were killed. The purpose was to prevent the political participation of FARC. This time round the FARC’s real and perceived security will be central to the success of the transition. Therefore, the central challenge to the FARC’s transition and reintegration in Colombian society is their ‘security dilemma’. They need to give up their weapons to join the democratic political process, but by giving them up they give up their only bargaining chip and put their lives at risk. This is the classic dilemma faced by non-state armed groups attempting to leave arms behind and the FARC is no exception. The 28 ‘normalisation zones’ have been thought out to allow for the FARC fighters to lay down their arms gradually within 180 days as they prepare to reintegrate into Colombian society. The FARC will also need to be very clear about disassociating themselves fully from armed action, which was not the case previously. One difficulty in this process is that the FARC will be demobilising even as a number of other armed groups are still operating. In this context, the de-stigmatisation of the FARC by government officials is essential. Gestures like the one made by President Santos during the signature of the cease-fire agreement on 23 June can go a long way to humanise the FARC and signal that they should not be targeted. He said that all his life he had been the FARC's implacable enemy but that “now, as head of state, I will defend the FARC's right to express themselves”. But it is not only the FARC fighters and militias that need to be protected, it is also the human rights, peasant, indigenous and afro-Colombian leaders often coming from the same marginalised areas and have been targeted in particular by right-wing (ex) paramilitary groups. It is particularly worrying that 35 of these leaders and human rights defenders have been killed in the first six months of 2016. The FARC will also need clear judicial guarantees. Like with most transition processes, timing and sequencing are key. The Colombian government and the FARC negotiated a subtle balance between peace and justice setting the agreement squarely in the camp of restorative rather than punitive justice. But the law that would amnesty FARC members for political crimes will only come into effect through the legislative act for peace after the plebiscite. If the plebiscite result is a victory for the ‘No’ camp, then the FARC will be left in a limbo of huge uncertainty having already started to concentrate in the ‘normalisation zones’. This is a worry for the FARC. The detention in June of Carlos Velandia, a former ELN leader who demobilised after spending ten years in jail, adds to this concern. Velandia was only released thanks to a direct Presidential intervention nominating him as ‘peace facilitator’. Security and judicial guarantees from the government are essential to allow the FARC to transition fully. At the same time, the FARC have to make their political case, be very clear about leaving weapons and the use of force behind, but also ask for forgiveness for past violence as they did on 11th of September with relatives of the 11 Valle congressmen they had assassinated. After all, the essence of politics entails that they make a convincing case to the population that their transition is real not just in words but in deeds as well. If you liked this article, follow us on Facebook and Twitter.